Autograph album with inscriptions from 1888 to 1892 that was kept by a "Neta" of Shoals, Indiana. I believe she was Juanita Marsh, whose name also appears as Waneta Marsh. 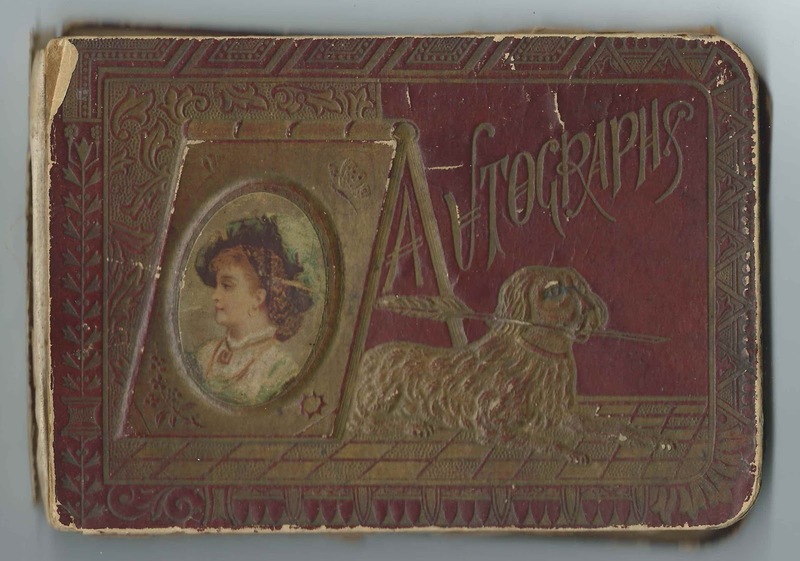 Neta inscribed a page in 1889 at the beginning of the album. The album, whose pages are disbound and badly chipped, measures approximately 7" by 4-3/4". It contains the sentiments of nearly 40 of Neta's friends and schoolmates. An alphabetical list of the inscribers, together with any personal information they offered, appears at the end of this post. Juanita Marsh, or Waneta Marsh, was born March 21, 1876 at Shoals, Indiana, the daughter of George H. Marsh and Mary C. (Hamilton) Marsh. It appears that Neta never married; she died on August 14, 1922 at Carlinville, Illinois, and is buried in the Spring Hill Cemetery at Shoals, Indiana. Her Illinois Death Record and her Find a Grave memorial show her name as Juanita. Florence; inscribed on January 14, 1889 at Shoals, Indiana, and wrote: "When after years when this you see, I wonder what your name will be. 'Oh', I guess it will be Miss Green." Presumably Neta had her eye on a beau named Green. Interestingly, one of the inscribers was Charlie Green; could he be the implied Mr. Green? Florence; inscribed on January 14, 1889 at Shoals, Indiana. "When after years when this you see, I wonder what your name will be. 'Oh', I guess it will be Miss Green." Presumably Neta had her eye on a beau named Green.
? 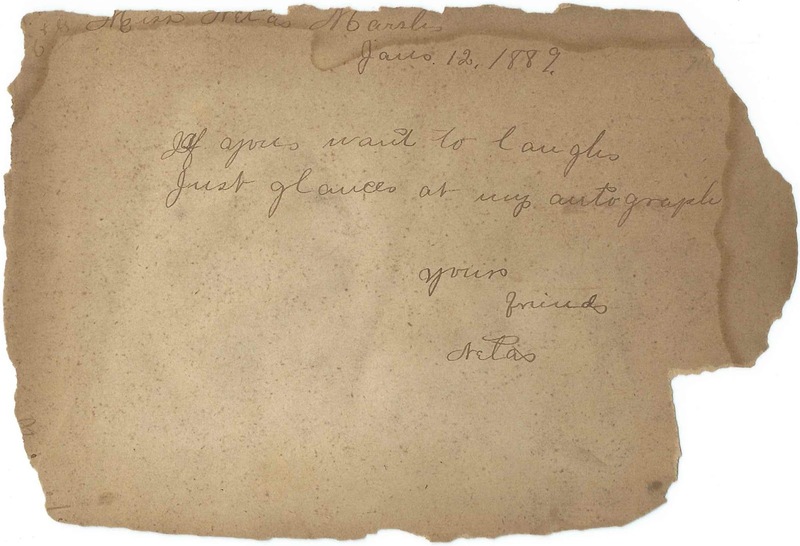 ; inscribed on April 13, 1891 at Shoals, Indiana; implies that Neta had brown eyes. Inscriber's name might have been Vester, for Sylvester, possibly. Joe Clarke. 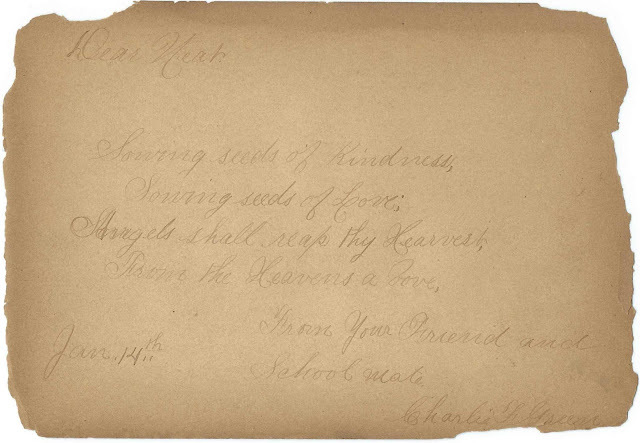 On a page inscribed on February 15, 1891, mentioning buggy riding and listing the names of 4 males and 4 females: E. Sheron; Alfred Harrod or Harris; Ike Westwood; Joe Clarke; Neta Marsh; Alice Drake; Maud Drake; Nora Taylor. Alice Drake. On a page inscribed on February 15, 1891, mentioning buggy riding and listing the names of 4 males and 4 females: E. Sheron; Alfred Harrod or Harris; Ike Westwood; Joe Clarke; Neta Marsh; Alice Drake; Maud Drake; Nora Taylor. 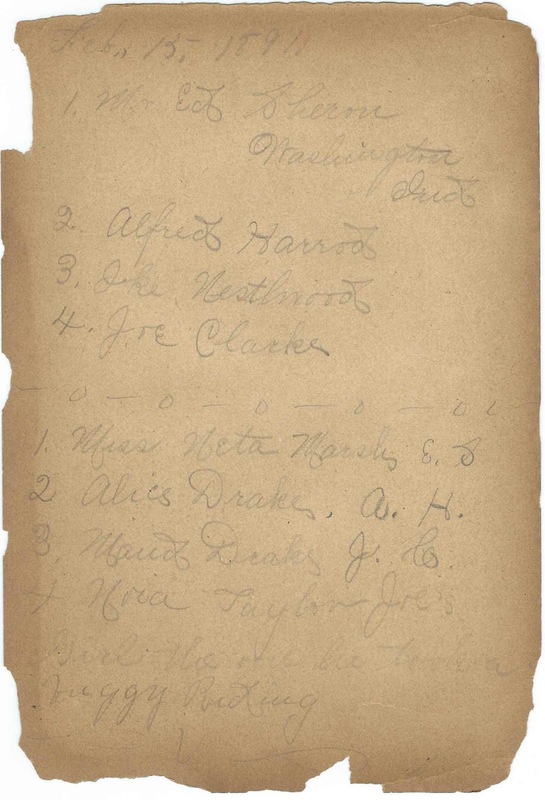 Maud Drake, On a page inscribed on February 15, 1891, mentioning buggy riding and listing the names of 4 males and 4 females: E. Sheron; Alfred Harrod or Harris; Ike Westwood; Joe Clarke; Neta Marsh; Alice Drake; Maud Drake; Nora Taylor. Charlie F. Green; could he be the Green mentioned by inscriber Florence as someone Neta was possibly interested in? Alfred Harrod or Harris. On a page inscribed on February 15, 1891, mentioning buggy riding and listing the names of 4 males and 4 females: E. Sheron; Alfred Harrod or Harris; Ike Westwood; Joe Clarke; Neta Marsh; Alice Drake; Maud Drake; Nora Taylor. Neta Marsh. 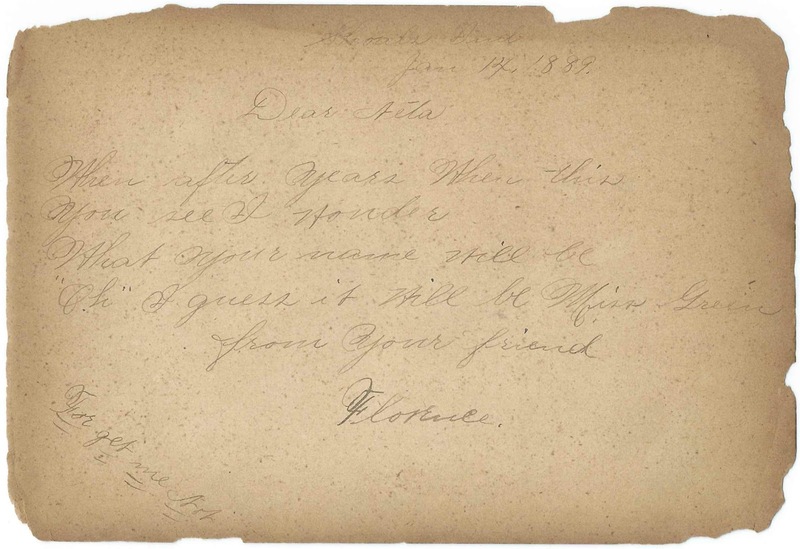 On a page inscribed on February 15, 1891, mentioning buggy riding and listing the names of 4 males and 4 females: E. Sheron; Alfred Harrod or Harris; Ike Westwood; Joe Clarke; Neta Marsh; Alice Drake; Maud Drake; Nora Taylor. E. Sheron of Washington, Indiana. On a page inscribed on February 15, 1891, mentioning buggy riding and listing the names of 4 males and 4 females: E. Sheron; Alfred Harrod or Harris; Ike Westwood; Joe Clarke; Neta Marsh; Alice Drake; Maud Drake; Nora Taylor. Presumably the Ed Sheron who inscribed an individual page. Ed Sheron; inscribed on February 10, 1891 "Written by a very dear friend"
Nora Taylor. On a page inscribed on February 15, 1891, mentioning buggy riding and listing the names of 4 males and 4 females: E. Sheron; Alfred Harrod or Harris; Ike Westwood; Joe Clarke; Neta Marsh; Alice Drake; Maud Drake; Nora Taylor. Ike Westwood. On a page inscribed on February 15, 1891, mentioning buggy riding and listing the names of 4 males and 4 females: E. Sheron; Alfred Harrod or Harris; Ike Westwood; Joe Clarke; Neta Marsh; Alice Drake; Maud Drake; Nora Taylor.